institutions re-affirming the importance of our mission and the work we're doing at GOALS. Connecting students to nature – How intensity of nature experience and student age influence the success of outdoor education programs. A study published in the Journal of Environmental Education Research found that student age and length of time in natural surroundings both influence positive changes in connectedness to nature - one of the primary objectives of every GOALS expedition. The strength of students’ connection to nature following participating in two outdoor environmental education programs were analyzed in this study. Both environmental education programs studied shared a primary goal of "reconnecting students with nature through memorable hands-on experiences in a natural environment" - a rainforest in this particular case. "Mud monsters" feeling connected to Cataract Canyon toward the end of their 5-day GOALS expedition. A total of 601 students ranging in age from 7 to 18 years old were randomly assigned to one of three subject groups; a 5-day residential environmental program (n=194); a 1-day outdoor educational program (n=182); and a control group who received lessons at school covering the same content (n=225). A self-report tool called The Nature in Self (INS) scale was used for data collection. Participants used a scale ranging from 1 (feeling completely separated from nature) to 7 (feeling completely connected with nature), and students in all three groups completed the INS three times: 2 weeks prior to their experience (pre-test), immediately after (post-test), and six weeks after the experience (retention test). Baseline (pre-test) scores showed no significant differences between the 5-day and the 1-day sample. Post-test scores indicated that both experimental groups (5-day and 1-day) had significantly stronger connections to nature than they did prior to the experience. The respective control cohorts did not show any significant change in individual nature connectedness. Retention-test scores indicated that both experimental groups had highly significant long-term increases in connectedness to nature. This increase, however, was significantly stronger for the participants of the 5-day program. This study indicates that extended outdoor environmental education programs - like those that GOALS provides - are more effective in creating positive long-term shifts in the way participants perceive their level of connection to nature than shorter immersion programs or lessons taught in the classroom. Getting kids out of the classroom for a few hours is a great place to start, but if we are to create long-term changes in the way kids view their connection to nature, this study (and piles of empirical data collected by GOALS) makes it clear that they need to spend several nights under the stars! Braun, T., Dierkes, P., (2017). Connecting students to nature – How intensity of nature experience and student age influence the success of outdoor education programs. Environmental Education Research, 23(7), 937-949. A study published in the Journal of Experiential Education found that outdoor education improves students' engagement in and motivation for learning. 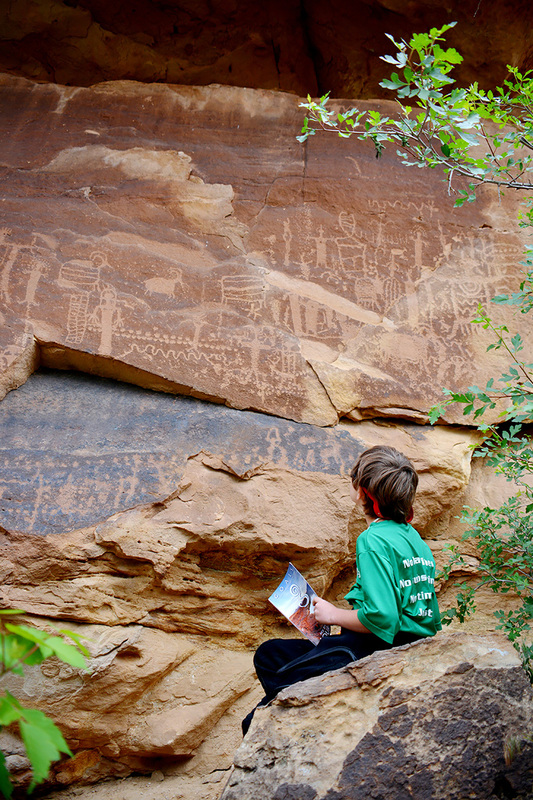 Feeling engaged and motivated to learn at the Flat Canyon petroglyphs in Desolation Canyon of the Green River. This study was conducted in response to earlier research that suggests experiential outdoor education is being phased out of many schools in the United States, due to an increasing emphasis on preparation for standardized testing. Concurrently, and perhaps in a related manner, research suggests that apathy for school-related learning is high among adolescents. Thus, this study aimed to determine if experiential outdoor education for middle school-aged students is valuable - for both learning and for student engagement. - individual interviews with all participants following the outdoor “camp” experience. Students and teachers involved in this study were asked about what they felt made the camp a worthwhile experience, which activities were valuable and not valuable, and what could be done to increase the value of the camp experience. Researchers then used the interview responses from participants in combination with their own observational notes to evaluate the value of the outdoor experience. Results indicated that the students enjoyed learning environmental science concepts in a hands-on, active, and experiential way. Further, the outdoor component added depth and meaning to their indoor learning activities. These findings are consistent with previous research, which found that deeper and more effective learning occurs when students are excited and emotionally engaged - both of which are accomplished through active, in-context, outdoor environmental education. 79% of the student participants (44 out of 56) indicated that the outdoor education camp was worthwhile. Additionally- and perhaps more importantly - adolescents who had come to view school-based learning as meaningless and disengaging were motivated and actively immersed in this field-based learning experience. Some students who were originally fearful and anxious about spending 2 days and an overnight in the wilderness gained confidence and a sense of comfort about being immersed in a camp experience. Finally, several students with special needs – who tended to be disengaged and unsuccessful during indoor activities – demonstrated leadership skills during the outdoor experience. The findings of this study are in line with many observations made over the years by GOALS guides, leaders, and chaperoning teachers. Often, students who present behavioral difficulties in the traditional classroom setting thrive on GOALS expeditions. This may be due to boredom at school, a sense of being overwhelmed by material presented that is difficult to comprehend, or any of one countless other factors. The underlying reasons for their struggles at school are not the important piece here - rather, their successes, leadership potential, and shift in engagement in the canyon should be focused upon. A study posted in Journal of Adventure Education and Outdoor Learning found that curiosity, not risk, may be the motivating factor in children’s playful engagement with nature. This article presents the concept of “curious play” as a theoretical framework for understanding children’s self-directed play in natural landscapes. “Curious play” is contrasted with the idea of “risky play” — often described as play in which children voluntarily engage in behaviors they consider somewhat dangerous. With risky play, it’s generally understood that the excitement of danger is what draws children into the play situation. Curious play, on the other hand, is based on the premise that what children seek in play is the excitement of discovering what is happening and the extent to which they can experience and master unpredictable situations. In this primarily theoretical article, the authors used three different sources in developing their concept of curious play: re-analysis of data from an ethnographically inspired study of children playing in nature; a critique of the concept of risky play; and phenomenological and cultural-historical theories of children’s play and play environments. Engaging in the excitement that comes inherantly with "Curious play" on the Rogue River in Oregon Canyon of the Green River. Observation, field dialogue, and photo elicitation were used in collecting data for the original ethnographically influenced study. Parents of 47 of 60 children attending a family summer camp in Norway agreed to allow their children to participate in the study. While every informant contributed to the study during the observation period, seven boys aged 6–10 were the key informants. Organized camp activities included climbing, hiking, fishing and visiting a mountain goat farm. The children also played freely in natural areas near the camp. The focus of the study was on how children played in what could be called wild nature. Data collection included observation of and dialogue with the seven key informants all day long throughout the week. It also included photo-elicitation sessions with three of the boys. The boys were encouraged to take pictures throughout the day. The photographs were then used as reference points for dialogue on their play experiences and feelings related to those experiences. A re-analysis of this data allowed the authors of this article to compare the curious play and risky play frameworks for understanding what motivates children’s play in nature. They concluded that risk or uncertainty was not the impetus for these children’s play in nature. They found, instead, that the children’s curious engagement and playful interactions with the environment were motivating factors for the play. This interpretation suggests that as children become engaged in play, they seek and create affordances. It’s as if the natural elements and the children actually play together. In critiquing the concept of ‘risky play,’ the authors did not question the assumption that children seek risk-related challenges and that natural environments invite forms of play involving risk of physical injury. What they did dispute was the premise that children innately seek physical danger and that risk is essential to children’s growth. The authors, in comparing curious play with other theories of children’s play and play environments, note that the curious play framework is consistent with exploratory play but adds the idea that children interactively embody their surroundings through play. Affordances, in this context, become not only what the environment has to offer but also what children discover and create about themselves and the world in which they live. A review on research studies finds that playful styles of nature engagement yield multiple benefits for children. Play time on the boat slide on the Green River in Desolation Canyon. “Spending time in natural areas as a child is associated with adult pro-environmental attitudes and feelings of being connected with the natural world, and is also associated with a stronger sense of place. Living nearby green spaces is associated with greater physical activity. Spending time in nearby nature leads to improvements in mental health and emotional regulation, both for specific groups of children (such as those with ADHD) and children as a whole. Children who take part in school gardening projects improve in scientific learning more than those who do not, and have healthier eating habits. Experience of green environments is associated with greater environmental knowledge. Gill, T., (2014). The benefits of children's engagement with nature: A systematic literature review. Children, Youth and Environments, 24(2), 10-34. A study posted in Applied Environmental Education & Communication found that nature connectedness plays an important role in human well-being. A literal connection with nature. One of many creatures that calls Desolation Canyon of the Green River home. The aim of this study was to examine the influence of the natural environment on human well-being. Participants were limited to individuals who choose to spend time in healthy natural environments and who consider nature connectedness important for their well-being. Nine such individuals were identified and agreed to be interviewed for this study. Four questions asked during the one-on-one semi-structured interviews shaped the conversation: What kind of exposure do you have on a regular basis with nature? What do you think well-being is? How did your connectedness with nature develop? To what extent does exposure to the natural environment influence your well-being? This study was conducted in an urban area in South Africa by two researchers – one specializing in environmental education and the other in psychology. The nine interviewees (ranging in age from 30 to 60) represented different races and genders. Their professions ranged from administrative and technical areas to public service fields. Major themes emerging from the data analysis included the multidimensionality of wellbeing, how to achieve well-being, the influence of the natural environment on well-being, and the kind of thoughts and feelings experienced when in a natural environment. All participants indicated that they played in a healthy natural environment and developed their sense of well-being in nature at an early age. Most of the participants said that interaction with the natural environment played a significant role in their physical, emotional, and psychological well-being. They also felt that engagement with nature promoted their cognitive functioning and social cohesion. These findings support the idea that nature connectedness plays an important role in human well-being and that children’s engagement with the natural environment should be encouraged from an early age. Ferreira, J.G., Venter, E., (2016). The interconnectedness between well-being and the natural environment. Applied Environmental Education & Communication, 15(4), 291-300. Feeling the "Girl Power"while rowing boats on the Rogue River in Oregon. This study investigated the overall eﬀectiveness and value of multiple extended outdoor adventure education (OAE) experiences as an option for schools interested in promoting noncognitive factors in adolescent students. Noncognitive factors refer to attributes, dispositions, social skills, attitudes, and intrapersonal resources which support student success. OAE uses remote outdoor settings for such adventure activities as backpacking and sea kayaking to foster skill development and personal growth. While previous research documents the effectiveness of OAE in promoting noncognitive factors, most OAE studies conducted in the U.S. examined stand-alone programs (such as Outward Bound and National Outdoor Leadership School) versus programs linked with classroom learning. This research was designed to address this gap by investigating the use of OAE with intact groups of students from the same school. Students, teachers, and administrators from an all-girls’ school participated in individual interviews focusing on their experiences and insights relating to their school’s OAE program. This program sends nearly all students on six-day/ﬁve-night backcountry expeditions during their 7th, 9th and 11th grades. The students travel in small groups of 8–12 students, 2–3 National Outdoor Leadership School (NOLS) instructors, and a faculty member from the school. All student interviewees participated in a backpacking expedition within the previous 12 months. Student interviews, lasting between 20 and 45 minutes, focused on highlights and challenges of the OAE experience, important lessons, and impacts on relationships. Questions asked during the faculty interviews focused on how the OAE experiences inﬂuenced school culture, classroom and learning behaviors, and relationships among and between students and faculty. The interviews were audiotaped and transcribed. Data analysis focused on identifying primary themes and connections among themes. Students from each cohort identified ways in which lessons from their OAE experiences helped them succeed in school. Examples included improved decision-making and communication skills which helped them navigate collaborative projects and interpersonal conﬂicts. A primary advantage of school-related OAE programs over stand-alone programs is the opportunity to re-visit, reinterpret, and reinforce the lessons learned during the backcountry experiences. Additionally, while the lessons learned support the educational needs of adolescents, they also foster a sense of school community. This research report includes a discussion about how the outcomes from school-related OAE experiences can contribute to school success, both individually and collectively. Richmond, D., Sibthorp, J., Gookin, J., Annorella, S., Ferri, S., (2017). Complementing classroom learning through outdoor adventure education: Out-of-school-time experiences that make a difference. Journal of Adventure Education and Outdoor Learning, 1-17. Outdoor play - Does avoiding the risks reduce the benefits? Taking on healthy risk head on in one of the rapids in Cataract Canyon. Play is critical to children’s healthy development. Little and Wyver examine outdoor play with a focus on early childhood education and urban Western culture. The authors review a number of social and environmental factors that have influenced children’s outdoor play experiences in recent years (e.g., traffic, lack of space, other time demands, and parental fears). Little and Wyver discuss the importance of children’s experience with risk for healthy development, including children’s ability to develop and refine their motor skills and enjoy and gain confidence in being physically active. The authors also review literature related to the impacts of not providing children with opportunities to engage in challenging and risk-related experiences, including children’s engagement in inappropriate risk-taking and underdevelopment of decision-making skills related to making sound risk judgments. Little and Wyver discuss the inability of many early childhood educators to provide challenging and stimulating outdoor experiences to children due to restrictive regulations and a cultural emphasis on eliminating or minimizing physical risk. The authors review the difference between hazard and risk and emphasize the importance of considering risk within the larger context of children’s development, as well as the need to focus on identifying and fostering a risk balance that is appropriate for each individual child. In concluding their article, Little and Wyver articulate a model they developed that illustrates possible pathways from specific factors (e.g., poor outdoor environments or fear of litigation) to minimization of risk-taking and developmental outcomes, and emphasize the need to examine early childhood education policy and practice. Little, H., Wyver, S., (2008). Outdoor play - Does avoiding the risks reduce the benefits?. Australian Journal of Early Childhood, 33(2), 33-40.